Misunderstandings and misdeeds of a mind that lies – To want to fly – The Egg of Columbus of the initiatory path. The best quality in man is the creative experience he has and he can transmit. It starts from the desire for knowledge, which is only partly satisfied by books; indeed, formal reading doesn’t reach the deep meanings of which we only perceive the presence (root meanings and archetypes). This limit is the boundary between learning and knowing, between abstract sciolism and direct experience, practice and experiment. The best quality in man is the creative experience he has and he can transmit. It starts from the desire for knowledge, which is only partly satisfied by books; indeed, formal reading doesn’t reach the deep meanings of which we only perceive the presence (root meanings and archetypes). This limit is the boundary between learning and knowing, between abstract sciolism and direct experience, practice and experiment. The blending of ‘conscience and knowledge’ is the antithesis of the opacity of a mind that lies, even to itself (see ‘From reason to Pure reason). Science and conscience are insuperable barriers for the misunderstandings of the lower mind, strongly involved with the drives of the nature of the physical-animal body. By developing a kind of inner dialogue, mind and conscience together can overcome the state of subjection towards the lower nature. Once the latter has been silenced, new mental requisites appear and this time they belong to the higher nature (see subtle conscience). As the conscience grows the mind changes, using the physical senses in a subtle way (see physical and subtle senses). An example of this process is tactile sensitiveness which reflects things for what they are, rather than giving a distorted refraction of reality as it happens with the lower mind (physical-concrete). Mental sensitivity is tactile when it comes from the subtle evolution of the physical touch. It must not be confused with intellectual sensitivity, which is contiguous but different from intelligence. A prehensile mind is more suited to discover what can’t be penetrated by reading; it acts as a physical contact between the conscience of the thinker and the idea (see empathy, empathic intelligence and intuition). In other words, comprehension flows in the contact between the essence of the observer and the essence observed (see knowledge by contact). The lucidity of creative intelligence is the best antidote against mental obscurity; it becomes a strong deterrent to evil. Initially, though, we are still intellectually short-sighted and spiritually deaf. Therefore since we lack experience and ability of discernment, it is ‘the right thing’ to take possession of other people’s thoughts to stimulate our mental growth, on condition that the dependence doesn’t go on for longer than necessary. Indeed, although at first intellectual dependence brings advantages, such as the acceleration of the formative process, on the long run it has serious contraindications. We can say that building ourselves on other people’s ideas is a necessary evil. It is necessary because in order to build our own identity without having complete ideas of our own, it is useful to use external ideas; it helps educating instincts and passion by limiting puerile fantasies. It is evil because relying on other people’s ideas stops our imagination and causes subjection (see transfer) towards whom or what has been used as a model. Furthermore, inexperience can turn every predilection into cult. However, the worrying thing is not the veneration of a leading figure (see adoration and cult of a personality), nor the exaltation of ideas borrowed to strengthen one’s own statements. At the initial stage, what is worrying is the inability of the observant to discern, understand and want; thinking he can decide for his own welfare, he chooses what he likes and not what he needs. Recklessness is the factor that stops a growth that, according to some initiatory teachings, can go much farther than the 777 cycles of life. Recklessness is also the cause of the ‘dark night of the soul’. This is the name given to the stage where the subtle conscience (soul) is obscured by the physical counterpart, which is focused on the material development. Recklessness is also the basic element of ‘Free choice’ with decisions motivated by impulse and choices left to chance or ‘luck’. Free choice is in actual fact an arbitrary faculty far away from the spirit of ‘Free Will’, which is a result of the soul’s sensitivity. Said that, we must reflect on how reassuring it can be to use ‘free choice’ to decide about our mental growth (maybe even spiritual); how reliable it can be to follow ideas we can’t understand or judge entirely yet. To leave it to chance brings trouble, especially in the probation period. Despite the value of the contents, lack of preparation and understanding can cause disasters, misunderstandings and misdeeds, which damage ourselves more than the humankind. When Aurobindo wrote ‘…when you achieve true knowledge throw the books away as if they were on fire…’, he didn’t mean to discredit sciolism or to mortify books. He only meant that it can be extremely counterproductive to rely on other people’s judgment once reached a true autonomy of thought. We must stress that autonomy of thought is not associated to free choice, but it is the complete maturation of mind and conscience. According to a beautiful metaphor ‘we can free our mind by spreading the wings of our thoughts’. To spread the ‘wings of thought’, though, is a lovely but dangerous metaphor, if we ignore the common sense that tells us to spread the wings not too early and not too late. Remember Icarus, who flew too close to the sun. ‘who am I, where do I go and why’. This could become the Egg of Columbus for any researcher who wants to find a solution to his quest. 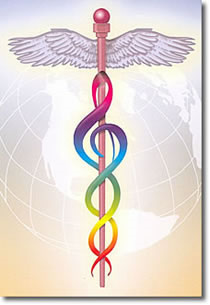 Many people might have recognized in the image above a particular Hermetic Caduceus. It is made of seven colors (like the seven notes) and the violin clef. It explicitly reminds us that the Egg of Columbus of the initiatory path is sound (see the biblical ‘Word’). It points out that ideas are better teachers than written words. This concept must be put into the right perspective. First of all it is not surreal to think that an idea is a living entity; that its (vital) power is equal to the intensity (frequency – vibration) that it transmits; that the quantity of force that it communicates is proportional to the force of the meaning it carries. To talk about living entity in force and power makes it easier to distinguish a ‘physical idea’ from a ‘subtle idea’ and at the same time it defines the meaning of ‘dead letter’. The latter is a term used by Initiates to stigmatize people who literally follow words devoid of soul, with particular intention to spiritually dead Doctrines. Therefore reading is not enough; likewise studying. The Wings of Knowledge are the metaphor of the direct contact between mind, conscience and exterior Idea. This contact must be built gradually with great ability and without approximation. Paraphrasing the metaphor, to elevate the thought is the (great) work of the Builder. The universal Thought is the Temple of Knowledge and Conscience is its Priest. This is Ars Pontificia, the science of building bridges between (inner) heaven and earth. It is the continuation of Ars Regia, the science of developing the mind.